...and there's been precious little time for blogging. A shame, that, 'cuz according to the stats this site's readership has been increasing this summer rather than going into the usual "lull". 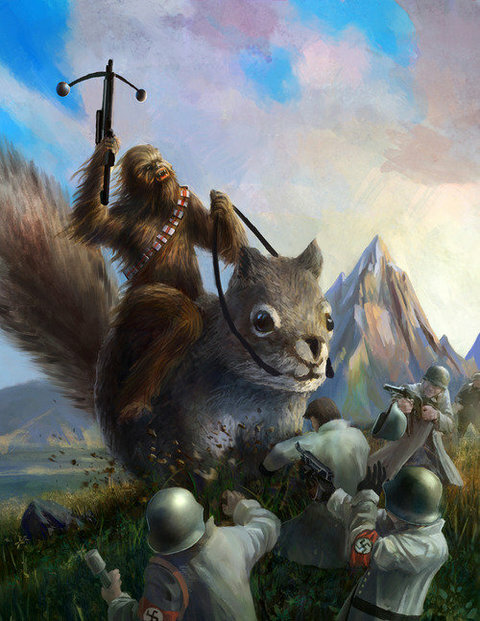 For the moment, I'll try to make up for things by posting this portrait of Chewbacca riding a giant squirrel while fighting Nazis. I can only wish that I had the skillz to pull off an image that awesome! As it is, somebody forwarded it to me this morning, and it was too good not to share. Kudos to whoever it was who executed this startling depiction.